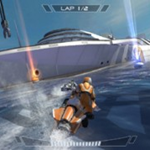 You may remember Riptide GP 2 from its debut on NVIDIA's SHIELD back in March, which showed off the game's updated effects, physics, and overall improved gameplay. Naturally, GP 2 is optimized for NVIDIA's Tegra 4 chip, which means that it will be one of the many games pushing SHIELD to the max once it's released to the masses. Thankfully, those who just can't wait to get into the jetski-packed action will be able to do so in less than a week – Tegra 4 isn't required simply to play the game. Vector Unit's AmA is still going on now – head here to read up on the company's feelings about branching out to the console market, their favorite video games, and much more.